Starr Mirza. All photos by Ben Droz. Starr Mirza awoke in a Florida emergency room at the age of 22 to find she had suffered cardiac arrest. And she was elated. For more than 10 years prior to that moment, Mirza had complained of exhaustion, flu-like symptoms and feeling faint, but doctors could find nothing wrong, dismissing her as, essentially, an attention-seeking drama queen. Eventually, so did her family and friends. And Mirza, then clueless about her Long QT Syndrome—a rare heart disorder that can cause dangerously fast and erratic heart rhythms—began to believe them. 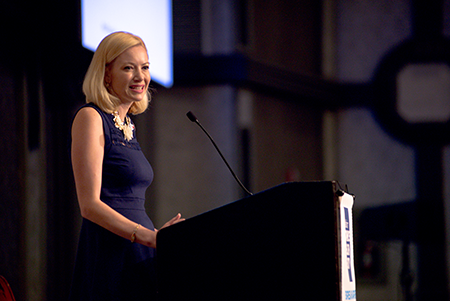 ​“Had one person listened to me and believed I was sick, that would have changed my whole world,” Mirza, now 38, told hundreds of Hadassah delegates gathered on May 16 at the Capital Hilton in Washington, D.C., for the Women’s Health Empowerment Summit. Presented by the Coalition for Women’s Health Equity, a group of 28 health and women’s organizations convened by Hadassah to press for gender equity in medical research and care, the summit was a cornerstone of Hadassah’s From Passion to Action: Women’s Health and Advocacy Conference from May 15 to 17 that culminated with a day of lobbying on Capitol Hill. ​Mirza’s quest for recognition and support was a fitting framework for the summit, which also highlighted the #MeToo movement and the broader call for women to be seen, heard and treated justly. ​Coinciding with national Women’s Health Week, the three-day conference—much of which was captured on video and is available on Hadassah’s website—reflected a bolstered commitment to the organization’s lifelong pursuit of women’s health. ​Despite the special American focus of this year’s national gathering—which also included the organization’s National Assembly and business meetings and a report from Hadassah Medical Organization’s director-general, Zeev Rotstein—Hadassah’s history and work are inextricably linked with the Jewish state, and the group’s commitment to Zionism remains unshakable, Weinman stressed. A rousing session with Israel’s ambassador to the United States, Ron Dermer, immediately following the summit underscored that point. 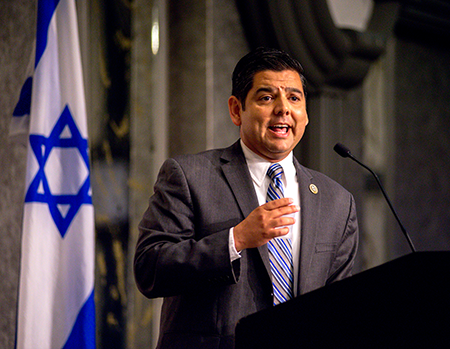 After Dermer’s speech vigorously praising the United States Embassy’s move to Jerusalem, members of the audience erupted in the Israeli song, “BaShanah HaBa’ah,” with several dancing before the podium. 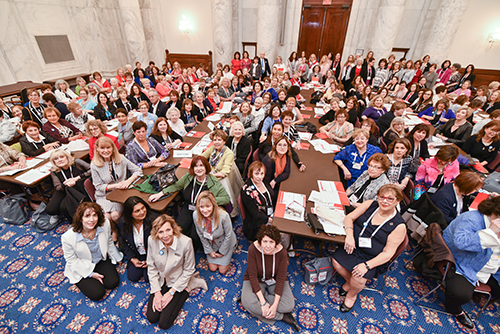 Hadassah members gathers on Capitol Hill to lobby senators and representatives. 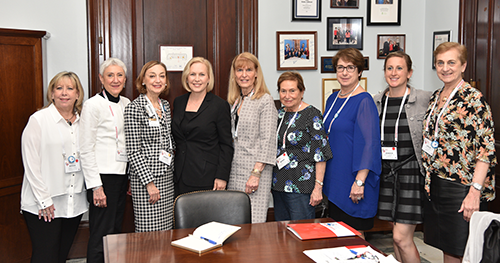 Lobbying Senator Kirsten Gillibrand (D-N.Y.; fourth from left) are Celebration 2018 Co-chair Rhoda Smolow; past Hadassah National President Marcie Natan; Hadassah Executive Director and CEO Janice Weinman; Hadassah National President Ellen Hershkin; Executive Division Vice President Renee Albert; Celebration 2018 Co-chair Frieda Rosenberg and Rosenberg’s daughter, Dr. Jessica Rosenberg, and sister, Leslie Rappaport. As Hadassah broadens its reach with new allies, approaches and members, it’s also strengthening its roots. “We’ve been on a crusade to find our nurse members,” said Susan Lafer, immediate past president of Hadassah’s Central Florida region and co-chair of its National Nurses Council, which hosted a conference session on May 15 featuring presentations on opioid abuse, aging and intimate-partner violence. The meeting, which offered continuing education credits to nurses, also featured Ruth Radiano, director of nursing at Hadassah Hospital on Mount Scopus, who discussed HMO’s leadership in areas such as organ replacement, pediatric AIDS care and cancer immunotherapy. 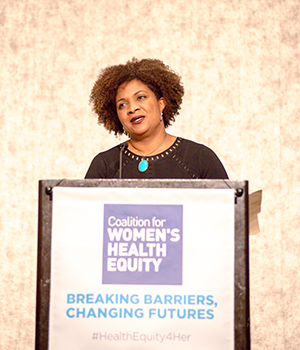 While the nurses’ session addressed matters of health in general, the summit narrowed in on women’s health disparities and the extent to which women feel undervalued and underrepresented in medical research and care. ​Ruiz lamented health disparities for and among women, noting that America claims the highest rate of pregnancy mortality in the developed world as well as a continuing dearth of female inclusion in research. ​According to the panel on women and clinical trials, women weren’t included in trials until 1993, due to the variability of the menstrual cycle as well as fears about causing birth defects. Despite the formation in the 1990s of offices devoted to women’s health across several government agencies, inequities persist—and Hadassah seeks to correct them through its advocacy. ​For Kathryn Fox, more funding for myalgic encephalomyelitis/chronic fatigue syndrome (ME/CFS) could provide hope for patients like her, so devastated by lethargy that she remains largely bedridden. (For more on this issue, read Hadassah Magazine‘s March/April 2018 health column on the disease.) In an emotional plea for research into the poorly understood malady, Fox began her presentation with a slideshow of herself before and after getting sick, with a collage depicting an active, happy child supplanted by an image of her looking nearly lifeless. “This is my life now,” Fox said, crying. Rachel Pomerance Berl is a freelance writer and proud Hadassah member in Bethesda, Md.